FRESNO, Calif. (KFSN) -- A tax research group says Summer gas prices are at their lowest level in twelve years. That same group says seven states will ask drivers to pay a little more toward improving the transportation infrastructure they use every day. 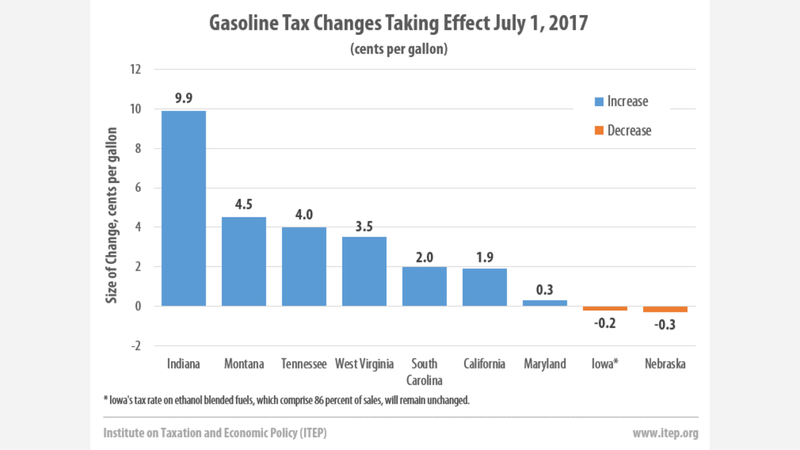 According to The Institute on Taxation and Economic Policy (ITEP), those states include California, will be doing this on Saturday, July 1 when they raise their gasoline tax rates. California is boosting its gas tax rate by 1.9 cents because of a formula that ties the rate to the price of gas. The state's diesel tax rate will not change on July 1. More significant, however, will be the 12-cent gas tax increase and 20-cent diesel tax increase that will take effect on Nov. 1, 2017 because of legislation enacted this year. -Montana: 4.5 cents, rising for the first time in 23 years. -Tennessee: 4 cents, for the first adjustment since 1989. -South Carolina: 2 cents, the first of six annual hikes of the same size and the state's first since 1989. -Maryland: 0.3 cents for inflation. -Iowa's gas tax drops 0.2 cents per gallon, although the tax on blended ethanol that accounts for most of the market will remain unchanged, according to the group. -Nebraska's gas tax is dropping 0.3 cents per gallon linked to the price of fuel, but with a 1.5 cent hike looming Jan. 1, 2018. The Institute on Taxation and Economic Policy (ITEP) is a non-profit, non-partisan research organization that provides timely, in-depth analyses on the effects of federal, state, and local tax policies. ITEP's mission is to ensure the nation has a fair and sustainable tax system that raises enough revenue to fund our common priorities, including education, health care, infrastructure and public safety.